You likely won’t see George Carlin, the Pointer Sisters, Richard Pryor and Danny DeVito at Superwash Express, Palm Coast’s newest mega carwash, on Cypress Point Parkway. The hint of outdated sexism aside—women are very proud to work at Superwash as well—the one thing the workers don’t do anymore, contrary to the promo, is wash by hand: car washes have long ago become mechanized by vaguely frightful maws of encircling cloth, jets of liquids and what this particular car wash calls its signature “lava bath,” a “carnauba wax ‘n shine” that flows all over your car’s paint with Vesuvian efficiency. (Carnauba wax, claims a team of authors in a college textbook, is the “queen of waxes.”) But there’s still plenty of work to do for those many employees once the vehicle is past the conveyor belt, with three lanes of cars making it possible to have up to six cars worked on simultaneously. The opening was something of an event at Superwash last week, drawing the chairman-elect of the Flagler Chamber of Commerce, Palm Coast’s mayor, a few county and city elected officials and others to mark what is, after all, a significant occasion, going by the sheer number of new jobs. The business drew some 120 applications even though most jobs start off at minimum wage (currently, $8.10 an hour), not including tips. Subers was referring to Paul Bradley, 55, a Port Orange resident who came over from England in the 1980s with $1,500 in his pocket, and is now the president and operating partner of the Superwash Express companies, of which Superwash in Palm Coast is only the latest of four businesses: the emerging empire includes car washes in Port Orange, Ormond Beach (where the facility is called Sparkle-N-Shine) and Mount Dora. 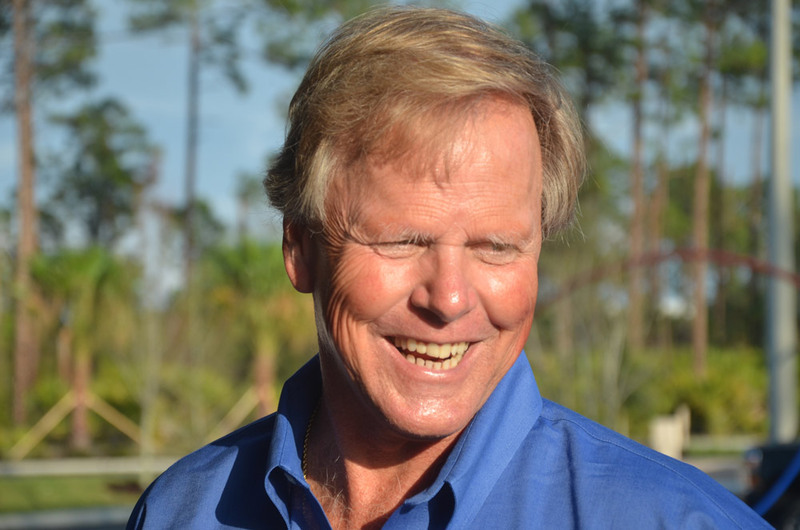 Bradley had started down the sparkled path with his brother in the early 80s, running a detail business, then a full-service car wash before he bought the Ormond Beach business in 1999. But the principal force behind Superwash is Jack Barrett, 70, of Mount Dora, who started in the business in 1982, when he was a real estate broker in Orlando, according to a brief synopsis of the company he emailed. (Barrett was not able to make the grand opening in Palm Coast.) Getting into the self-serve car wash industry was an outgrowth of his commercial real estate ventures. 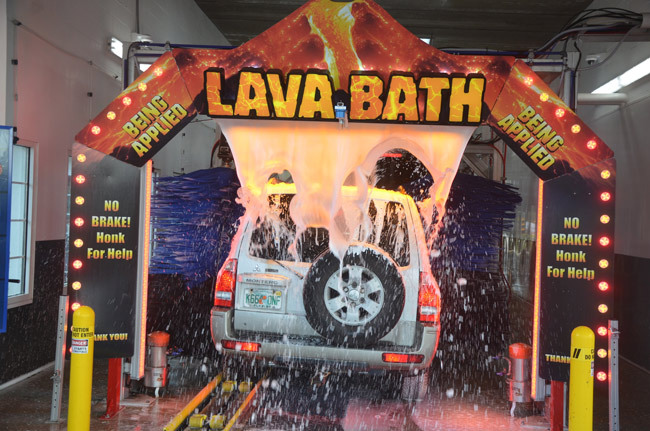 He built the first Superwash in Altamonte Springs in 1982, enhancing the experience with personalized service that made it more attractive for car owners to skip the automatic car wash at the gas station and opt for the extra attention. Barrett himself took particular care to build environmentally responsible car washes. And to nurture new business leaders. His first customer service employee? Paul Bradley. 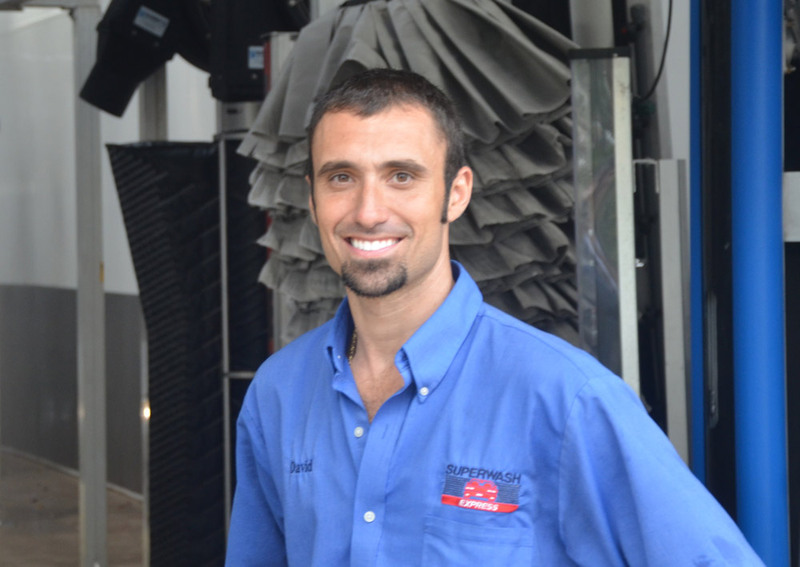 Barrett’s approach has developed a brand of management within the company, relying on its employees to make it up the ranks as they learn the business—among them, Paden Davis, who runs the Palm Coast Superwash after working in Port Orange 10 years, and David Verduzco, 31, general manager of the various Superwash locations and a part owner who started at the Port Orange location 13 years ago, when he was in high school. Listening to these stories one gets the sense that the diverse microcosm created by “Car Wash,” the movie, was no fiction: there’s a compelling tale behind every name in the real thing. “I started in the Port Orange location in my senior year of high school,” Verduzco said. “Just needed a little part-time job, worked there through high school, worked there through college, got my college degree, and then was going to start looking for a job, and Paul said wow, wait a minute, why don’t we see what we can do here.” So he started running the Mount Dora location, then ran the Port Orange location. Just wait for all the negative posts about low pay and part time jobs. Over the fact of somebody investing in our little town and bringing in both part time and full time JOBs that where not here before. Can some one enlighten me as to why people bring their car to wash when it is already clean and shining? we love the new car wash…been there twice already and they do a super great job! Great, another car wash like another hamburger joint, like another gas station , like another golf course , like another dollar store. 8.10 an hour minus taxes, big accomplishment . 8.10 per hour PLUS TIPS!!!! Where will they spend ALL that money? WHERE DO THE PEOPLE WHO EARN $8.10 AN HOUR LIVE? $8.10 + tips is a lot more than $0.00 + no tips. I do suppose that salary could be raised to about $20 an hour if people were willing to pay $75 to get their car washed. I don’t see that happening any time soon. Why complain about a business coming to town that is obviously wanted and needed? The salary paid is above the minimum wage and if a good job is done, hopefully people will tip and possibly it will average out in the $10-12 range. Not bad pay for a job not requiring advanced education or working in a dangerous environment. Should be a good opportunity for employment for those who are students or seeking a 2nd job. Went there today. Exactly what Palm Coast needed. An ultra modern car wash.
Good location away from the busy main business sections. On the down side it will soon put the other 1980’s style car washes out of business. They will not be able to compete with this new car wash.
#KatieSemore, you hit the nail on the head! Kudos! Thanks BlueJammers, it is nice to see someone agreeing once in a while. There will always be some who will complain about everything. They would complain if you gave them five $20 bills that you didn’t give them a $100 bill instead. 40 minimum wage jobs does not impress me. We need some REAL industry here with people making enough money to pay the skyrocketing rents and have discretionary spending dollars.